You have the power to set the stage for your child’s food choices! Parents know that anything labeled a “health food” is practically kid repellent, but this creamy-like food is even tempting to young tummies. Here are four reasons that yogurt is great for growing kids in a compelling infographic. Discover our story! The percentage of children getting enough calcium dramatically decreases after age two. Vitamin D and potassium intakes are low among children 2-11—both are often found in yogurt. The child’s bones grow quickly, and the calcium and protein found in yogurt are essential to children’s bone health. 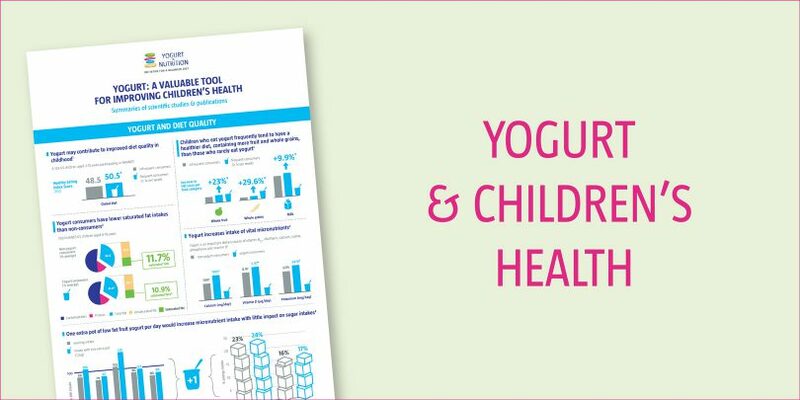 There is an evidence that children and adolescents who consume yogurt regularly (at least once a week) have a healthier diet than infrequent yogurt consumers. Children with regular yogurt intake seem to eat more fruit and whole grains than the infrequent yogurt consumers (1). Young yogurt consumers have also a higher intakes of calcium, vitamin D, and potassium than non-yogurt consumers (4). Last but not least, yogurt is a dietary source of vitamin B, riboflavin, iodine, and phosphorus for children (3). · In US children at the age of 6-17 year old,the intake of sweetened dairy products increases the number of dairy servings and has a positive impact on their diet quality, whereas sugary drinks and sweets have a negative impact (5,6). · While more than 50% of total sugars and 66% of added sugars in children’s diets come from sweet products (cakes, sweets, etc.) and drinks, yogurt accounts for only 1–8% of total sugars and 4–9% of added sugar across Europe (7). · Increased consumption of low sugar dairy foods, especially yogurt, at snack times, could increase the intake of important micronutrients without contributing to dietary excesses (8). Here’s the best part: yogurt consumption can help children to get their enjoying snack, while staying within the daily calories limits. But that’s not all. Yogurt delivers a powerhouse of nutrients that help support their health in an appealing and readily available way, which is unmatched withmany other foods. Yogurt may have important beneﬁts for children’s health, including reducing obesity and cardiovascular risk. Dairy foods intake is associated with a lower risk of childhood overweight/obesity (2, 9). Similar results are being found more specifically with yogurt consumption. Furthermore frequent yogurt consumption (more than once a week) is associated with an improved insulin profile in children and teenagers: a lower fasting insulin level, lower insulin resistance, and higher insulin sensitivity.Yogurt consumption also protects against tooth erosion in children and adolescents, whereas carbonated drinks, fruit juices and sweets increase tooth erosion (10). Finally, yogurt is versatile and fun! 1. Zhu Y et al., . European Journal of Nutrition 2015;54(4):543–50. 2. Moreno LA et al. Nutrition Reviews 2015;73(S1):8–14. 3. Williams EB et al. British Nutrition Foundation Nutrition Bulletin 2015;40:9–32. 4. Keast DR et al. Nutrients 2015;7:1577–1593. 5. Frary CD et al. Journal of Adolescents Health 2004;34:56–63. 6. Johnson RK, et al.. J. Circulation 2009;15;120(11):1011–20. 7. Azais-Braesco V et al.. Nutrition Journal 2017;16(1):6. 8. Hess J, Slavin J. Nutrients 2014;30;6(11):4750–9. 9. Lu L et al. Eur Journal of Clinical Nutrition 2016;70:414–423. 10. Salas MM et al. Journal of Dentistry 2015;43(8):865-75. And what if yogurt was the best snack for children?